SVL’s assistant vice-president for group corporate communications, Simone Clarke-Cooper, says there were many similarities between Gift of Love and #SimplyVestedinLove which made the synergy a natural one. “What drew us to the Gift of Love Foundation was the way they focused on performing small acts of kindness to make a big difference in the lives of the children of Nine Turns. #SimplyVestedInLove shares this philosophy. 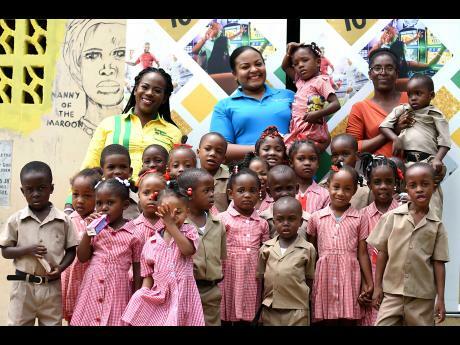 When we saw what Ayesha was trying to do, we were moved to support the efforts at the school,” Clarke-Cooper said. “This is the biggest donation we have received so far. We really appreciate it, and to know that it is something long term and can sustain them for a good period of time, is very important to us,” Allen said. “We had a call for nominations on our social media and we asked persons to nominate schools that they thought would need assistance, and we specified rural schools. Based on all the nominations we received, we chose Nine Turns Basic School. The children are so smart, so I’m so glad we chose them so they can get the assistance they need to further their education,” she said.